Disease has always had a major impact on armies at war, often producing more casualties than combat wounds. The history of the U.S. Army is full of examples of this fact. The Civil War Trust estimates that for every three men killed in combat from 1861 to 1865, another five died of disease. By the twentieth century, medical care and preventative measures had been greatly improved, but these advances were often difficult to implement on the front lines, and disease continued to exert an immense force in war, especially in the remote islands of the South Pacific during World War II. The average soldier serving in the Pacific Theater of Operations (PTO) fighting against the Japanese faced a great many challenges and dangers. Often overlooked by histories of the war, one of the most insidious of these was malaria. This disease, while not typically fatal to the infected soldier, would take him out of action for a prolonged period just as surely as if he had been wounded in battle. The Army’s fight against malaria is a fascinating story of man versus nature, with America’s success in the war against Japan at stake. Malaria is a tenacious disease that can have long-lasting effects on the infected person. American soldiers encountered two different types of the disease in the PTO: benign, which causes violent chills, fever, and weakness, and malignant, a form much more likely to cause death. Both types had the potential to turn a battle-ready soldier into a bedridden hospital case in a very short period of time. The disease itself is caused by a mosquito-borne parasitic protozoan that attacks the red blood cells and liver of the infected person. The damp, swampy environments encountered on many Pacific islands were ideal breeding grounds for the anopheline mosquitoes that transmit the disease. Furthermore, the many shell craters, foxholes, and ruts created during combat operations all served to collect water, offering plentiful opportunities for the insects to breed and multiply. When the mosquitoes feed on an infected person, they become carriers of the parasite, and then deposit the disease in the bloodstream of another person when they fed again. In this way, the instances of infection could quickly balloon, as each new person infected became a carrier through which more mosquitoes could pick up the disease, and in turn, infect additional victims, establishing a vicious cycle that proved very difficult for the Army to disrupt. As a result, the disease became a huge problem, waylaying thousands of soldiers and support personnel. According to the U.S. Army Heritage and Education Center, the Allied defenders of the Philippines were devastated by an epidemic of malaria. About 24,000 of the 75,000 American and Filipino soldiers involved in the desperate campaign to stop the Japanese advance in 1942 were suffering from malaria. If these troops had been healthy, they could have greatly bolstered the defense against the 57,000 Japanese invaders early in the war. The lesson learned by the Army from the Philippines was that effective malaria control was essential for the successful conclusion of the campaign in the Pacific. The year 1942 proved to be an absolute low point for the Army in its efforts to prevent malaria from ravaging troops deployed to the Pacific. Infection rates were high across the entire Southwest Pacific Area (SPA), and in some localized hotspots, astronomically so. 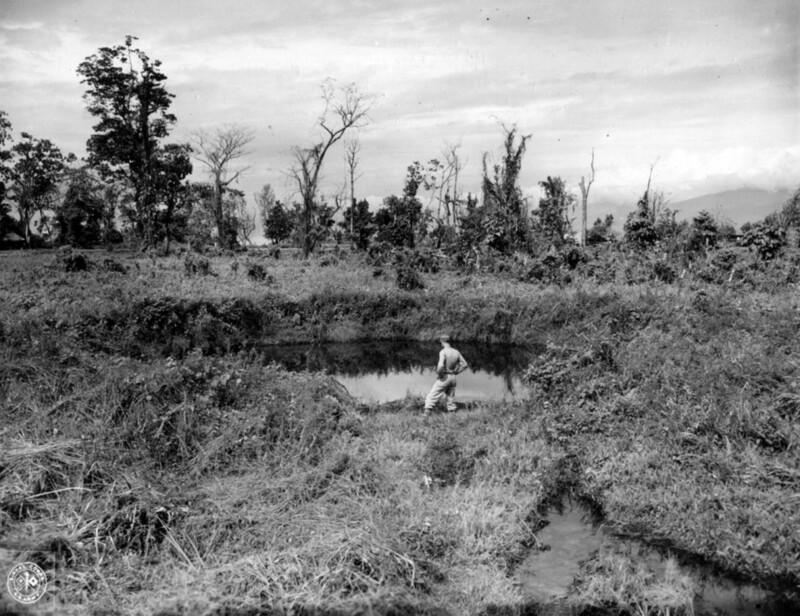 One of the hardest hit areas was the Allied base at Milne Bay, Papua, which provided support for the campaign against Buna and Gona in late 1942 through January 1943. During the campaign, malaria was rampant. According to the U.S. Army Center of Military History, incidence of the disease reached an astounding 4,000 cases per 1,000 soldiers per annum. Essentially, this was the equivalent of every single soldier at Milne Bay coming down with the disease at least four times throughout the course of the year. This had a devastating effect on the efficiency of the units based there, where it was estimated that they lost around 12,000 man-days a month in work due to the disease. Infection rates for the rest of the area of operations were not much better. According to tabulations done after the war, Army medical personnel treated 47,663 cases of malaria in the SPA in 1942. The rate of infection was calculated at almost 251 cases per 1,000 troops in the entire area. With a quarter of all troops infected, malaria was proving to be as large a menace to American operations as the Japanese. Additionally, it was discovered during the fighting at Buna that efforts to reduce the incidence of the disease quickly broke down once combat operations began. The Medical Department estimated that casualties due to this disease for this period outnumbered combat casualties on an order of seven to ten times. Lieutenant General Robert L. Eichelberger, commander of the U.S. forces bogged down at Buna, noted that “disease was a surer and more deadly peril to us than enemy marksmanship. We had to whip the Japanese before the malarial mosquito whipped us.” The high rate of preventable losses of manpower and work-days seen in Papua were simply untenable if the United States and her allies were to take the initiative and defeat Japan’s armies in the Pacific. 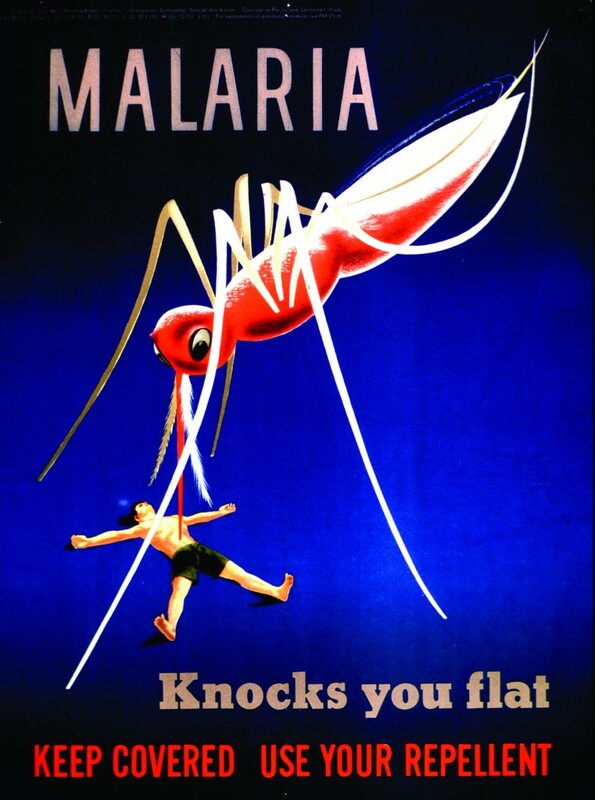 The first major step the Army took to turn the tide against malaria occurred in early 1943. In April of that year, Colonel Howard F. Smith, Medical Corps, was appointed theater malariologist. In this newly created position, he led the Army’s efforts to research and combat the illness throughout the PTO. Along with the Combined Advisory Committee on Tropical Medicine, Hygiene, and Sanitation, created by General Douglas MacArthur, Smith tackled the monumental task of creating and implementing the policies needed to stem the tide of malaria. Army medical officers soon realized that the Army needed a two-pronged approach to attack malaria. First, they needed to ensure that the Army forces were properly supplied with the necessary antimalarial medicines and anti-mosquito devices needed to prevent the onset of the disease. Second, they had to conduct a wide-ranging information campaign to educate soldiers in combat zones about the importance of using the supplied medicine and other protective measures. However, many challenges still lay ahead in the fight against malaria. The main problem facing the Army in the fight against malaria in the early days of World War II was securing a safe and reliable supply of necessary antimalarial drugs. The traditional treatment for the disease was quinine, a medicine derived from the bark of the cinchona tree. Quinine is an effective antimalarial, and has relatively few side effects that tend to be mild in nature. As a result, it was the preferred medicine used by the Army for treating malaria. As World War II approached, the world supply of quinine was largely under control of the Netherlands. The island of Java, a Dutch colony, was the world’s largest producer of cinchona, which thrived in its tropical climate. A consortium of growers banded together to form the Kina Bureau, based in Amsterdam, which dictated the supply of quinine and held an effective monopoly on this valuable commodity. As a result, when the Nazis occupied the Netherlands in May 1940, they gained access to the warehouses and manufacturing capabilities of the Kina Bureau, allowing them to dictate the distribution of processed quinine. With the Japanese occupation of Java, along with the rest of the Dutch East Indies in 1941, the raw supply of cinchona was lost as well, and America and her allies found themselves without access to any supply of the gravely needed medication or its raw components. A new source of antimalarials would be needed to fill the gap. With all sources of natural quinine in the hands of the Axis powers, the Allies were forced to turn to other antimalarials to aid their efforts against disease. Work on alternative drugs had been ongoing in the 1920s and 1930s, and fortunately, some alternatives were available for the Army to choose from. However, each of these alternatives had issues, mainly related to a variety of unpleasant side effects. One such option was a synthetic compound known as chloroquine. This drug was highly effective against the parasite that causes malaria, causing it to die quickly before it could reach the stage of full symptoms or infectiousness. However, it had serious drawbacks. Bayer, the company whose scientists discovered the compound, conducted testing in animals and concluded that chloroquine was so toxic that it could not be practically or safely administered to humans. As a result, the drug was shelved, and not considered a viable alternative to quinine for the Army. Postwar testing and research would go on to prove that chloroquine could actually be safe and effective in humans, and it went on to enjoy great success, but this came too late to be of assistance to the soldiers fighting in the Pacific. Another drug was needed for the Army’s immediate needs. Eventually, the most commonly used alternative to quinine used during World War II was a synthetically produced drug called quinacrine, which was commonly referred to in the field by the brand name Atabrine. 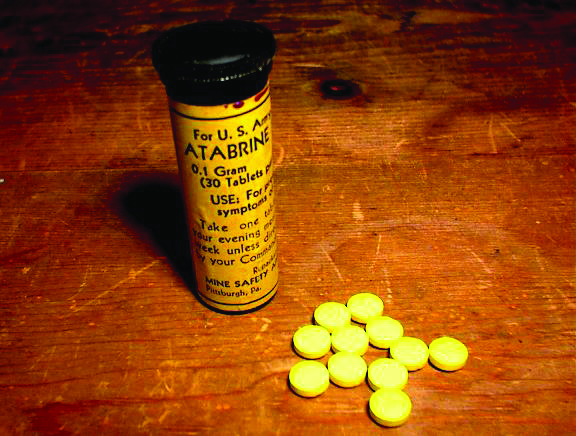 Developed by German scientists in 1931, America and her allies had no problems producing Atabrine in the quantities needed to keep their troops in the Pacific supplied with this essential drug. In fact, in Pharmacy in World War II, Dennis Worthen notes that the Winthrop Chemical Company quickly geared up production, delivering almost 1.8 billion doses in 1943, and an even more impressive 2.5 billion in 1944. It quickly became the antimalarial of choice for the Army. However, supplying troops with an sufficient quantities of Atabrine did not necessarily mean that they would take the medicine. There was no doubt that Atabrine was an effective antimalarial, but it came with a bevy of unpleasant, and in some cases, terrifying side effects. The most common side effects were nausea, headaches, and diarrhea. When Atabrine was first introduced for widespread use among troops at Guadalcanal, the recommended dose was .2 grams a day. Unfortunately, this dose caused a full twenty percent of the Americal Division to become ill with those side effects, including the division’s commander, Major General Alexander M. Patch. The dosage was quickly reduced to .05 grams a day, which allowed most troops to take the drugs without becoming ill. Nevertheless, when these effects were added to the symptoms of other tropical diseases, dysentery, and malnutrition that many soldiers experienced, it becomes easy to understand why they might have decided to avoid taking the drug as instructed. Additionally, several alarming and unique side effects were found to occur when taking Atabrine. One was its unfortunate tendency to turn the patient’s skin an unnatural shade of bright yellow. While this was not necessarily harmful, and the effect was only temporary, it was unnerving enough to cause many soldiers to forgo their medicine. Even worse was the fact that in some very rare cases, Atabrine could cause neurological problems. This might manifest in the form of nightmares, heightened anxiety, and, in rare cases, full-blown psychosis. Fortunately, it was soon discovered that these side effects could be greatly reduced by giving soldiers a large “priming” dose, followed by daily “maintenance” doses. Thanks to this system, psychosis was observed in only about one-tenth of one percent of the GIs given Atabrine during the war. Finally, rumors circulated, often aided by Japanese propaganda, claiming that prolonged use of Atabrine could lead to infertility. While this was not the case, it was yet another reason why a soldier might choose to forgo his daily Atabrine dose. 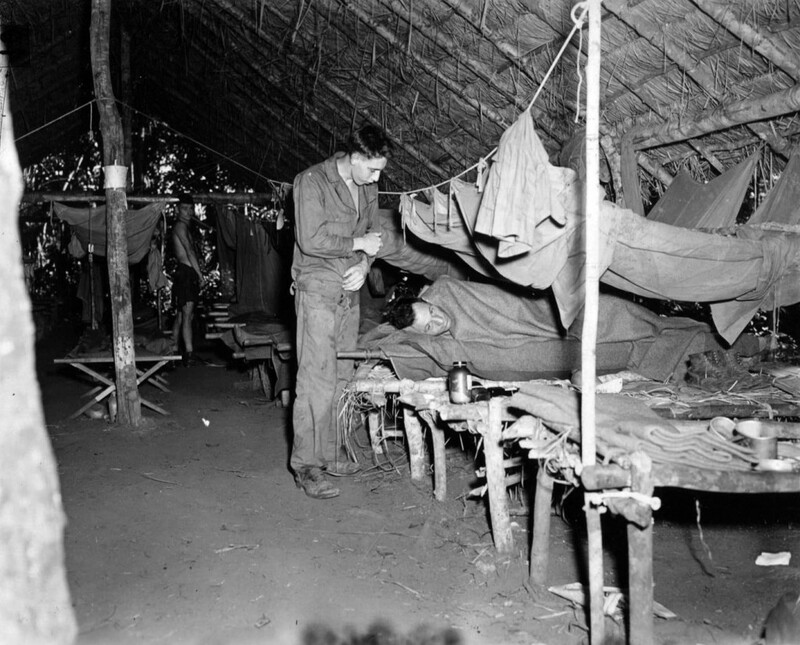 The rumors became so pervasive that the Medical Corps had to station medics in chow lines to distribute the pills and watch while each soldier took his dose. While the drug was effective if a soldier stuck to the dosing regimen, it was easy to miss doses in the heat of battle, when cut off from supply lines, or simply because a soldier decided the cost-benefit ratio was not one he liked. Atabrine was not the only tool the Army used to fight the spread of malaria in the Pacific. The fact that no one could ensure that all troops would take the medication consistently meant that additional measures needed to be taken to reduce the risk of infection as much as possible. One of the most important and effective tools the Army had against malaria was the insecticide dichloro-diphenyl-trichloroethane, more commonly known as DDT. Developed in the 1870s, DDT’s insecticidal properties were not discovered until 1939 by a Swiss scientist, Paul Mueller, who was looking for a compound that would kill moths in his closets and drawers. The effectiveness of the chemical was proven when he noticed that even after wiping out a container sprayed with DDT, flies placed inside would still die, proving that the compound had a persistent effect against insects. In 1942, an American military attaché in Switzerland sent back samples of the insecticide and the Army quickly took notice. Beginning in 1943, the Army began using DDT in a powdered form which was applied directly to soldiers and refugees in Italy, where a typhus epidemic was raging. It was discovered that this treatment was highly effective against the lice that carried the disease. The same powder was used in the Pacific as well, but the Army soon realized that DDT could also be useful against malaria. Traditionally, a large part of malaria control had been the use of pesticides sprayed onto building walls and floors, and in areas where mosquitoes were known to breed and rest. A major drawback to many of the insecticides available in the early days of the war was that they quickly lost potency and had to be reapplied every two weeks. DDT proved to be invaluable because of its long lasting residual effects, meaning it only had to be applied once every six months. It could also be mixed with diesel oil or kerosene and sprayed onto bodies of water where mosquitoes lay their eggs, further reducing the mosquito population wherever applied. By the end of the war, the Army had perfected a number of ways to deliver DDT, including backpack carried sprayers and even aerial spraying. It was not until after the war that many of the health and environmental concerns associated with DDT would come to light. At the time, the Army considered its use an unqualified success. It was clear to the Army that using antimalarials and insecticides were key to the fight against disease, but making sure troops at the front participated in these measures continued to be a problem. As a result, a third offensive front was opened against malaria, in the form of propaganda. An all out informational campaign was launched to exhort GIs to make use of their mosquito nets, to avoid situations where malarial mosquitoes were common, and to always take their Atabrine. 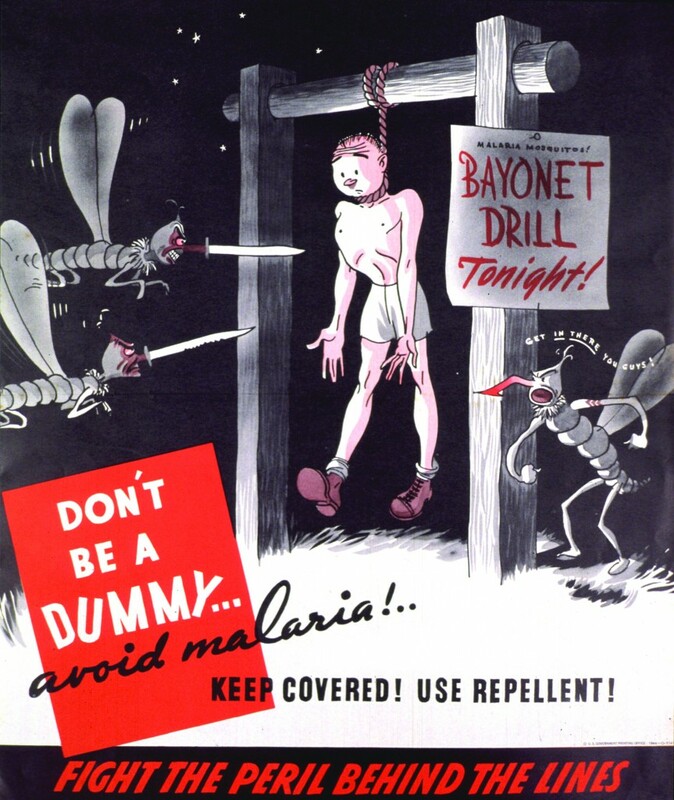 Additionally, wherever the Army set up camp, signs about malaria control were sure to appear. These ranged from the humorous to the macabre. In one particularly gruesome case, the 363d Station Hospital at Port Moresby, New Guinea, posted a sign adorned with two human skulls which simply read, “These men didn’t take their Atabrine.” While it is impossible to know what effect much of this propaganda had, the importance of educating the troops on proper malaria control was clearly taken very seriously by the Army. The fight against malaria was an ongoing struggle in the Pacific, and the disease affected both sides. By the war’s end, the increasingly cut-off Japanese were suffering extreme rates of infection. It was estimated that at times, up to ninety percent of Japanese troops in some locations were combat ineffective due to malaria and dysentery. At Buna, where American forces had learned hard lessons about the impact the disease could have, the Japanese fared just as poorly. After the battle, the 3d Portable Surgical Hospital records noted that every single Japanese prisoner they received was infected with malaria. Meanwhile, the U.S. Army had put together a largely effective campaign to protect its soldiers from malaria.